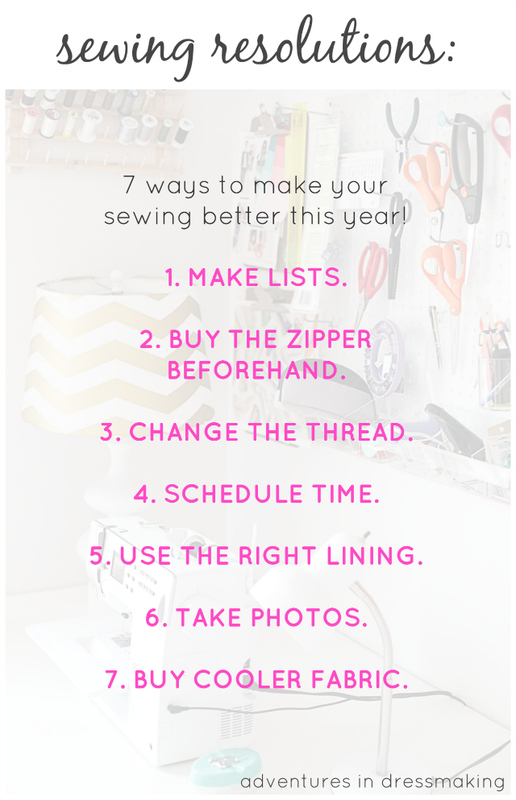 Sewing resolutions: 7 ways to make your sewing better in 2014! I'm not a big resolution-maker, most years; never have been. I love making goals, but I tend to do it throughout the year and I love the monthly goals people have more than the yearly ones, for the most part. Instead of making goals for the year, I'd rather make those same goals for the rest of my life! But as I was sewing yesterday (I've had the week between Christmas and New Year's off, as my office is closed!) I realized, when I sew I want to be more consistent and use the methods I know are right. It's sometimes hard to get motivated to prepare ahead of time or take the time I need to finish things nicely, but it makes for a much better product I can really be proud of! I started thinking of simple principles I can remember to stick to if I want to do my best. And here they are for you! 1. Make lists. For sewing ideas, I get inspired by blog posts, magazine pages, things I see in stores... all kinds of sources. I see a dress I love on a celeb in a magazine and tear the page out (did you see my old inspiration system?). I also pin things to my dresses inspiration board and DIY ideas board. And sometimes I just walk by a person on the street or a store display and get an idea! So to keep track, I make lists of projects I want to do soon. I do these digitally so I have them everywhere I go--Evernote, Google Tasks, and Google Calendar (see goal #4!) work for me, but you can use any tool you want! 2. Buy the zipper beforehand (or whatever notions you need). It is so frustrating when you finish a dress, open the zipper box, and find none in the right color and length! I need to plan ahead enough to stop by the fabric store and buy the right color when I plan a project. 3. Change the thread and wind a new bobbin. For years I've known that using a matching thread color makes a serious difference in the professionalism of sewing. But occasionally I get lazy and don't change to a matching color while I sew hidden seams, and it just doesn't make it as nice! Take the time! 4. Schedule time. I love to sew, especially when I have the house to myself and can find a good source for Gilmore Girls episodes online ;), but it's sometimes hard to sit at the machine instead of the computer. Put "Sew" on your calendar as a reminder and a way to block off that time! I sometimes even write "Sew: ___dress, ___ skirt, remade ___" or whatever as a reminder of what projects I want to do as soon as I can. Blocking off time will keep you from rushing through and doing what's fast rather than what's right! 5. Use the right lining. Lining fabrics, unfortunately, make a huge difference even though they don't always show (see this post). Buying the right lining for your project will make it lay better and will be more comfortable to wear. That doesn't mean you have to spend a lot of money on the lining, but buy the right weight and color for your project, out of whatever grade you can afford. Don't do what I sometimes do and scrounge around the bottom of your fabric stash for something somewhat acceptable! 6. Take photos. Especially if you're doing a refashion! !, take "before" photos, but for any project, really. Start by snapping a photo of the raw materials before you get started. You never know when you might want to refer back to it--if you're putting part of the original garment back together, e.g. or if you someday want to blog about it or share with a friend! Taking in-progress photos is also helpful for you and any future viewers of the project, and of course you'll want to have someone take a photo of you wearing or using the item. Sewing is something to be proud of, so show it off! It'll inspire you in the future! 7. Buy cooler fabric. My favorite projects are the ones with beautiful lace, perfect bright colors, or sleek stretchy knits I can't find all the time. If I see something I like and want to make it, I know I'll like it more if I take the time and dedication ($!) to buy the right fabric, either online or at a store. Makes a big difference! Make sense, right?! Here's the short version! That wasn't so hard, right? 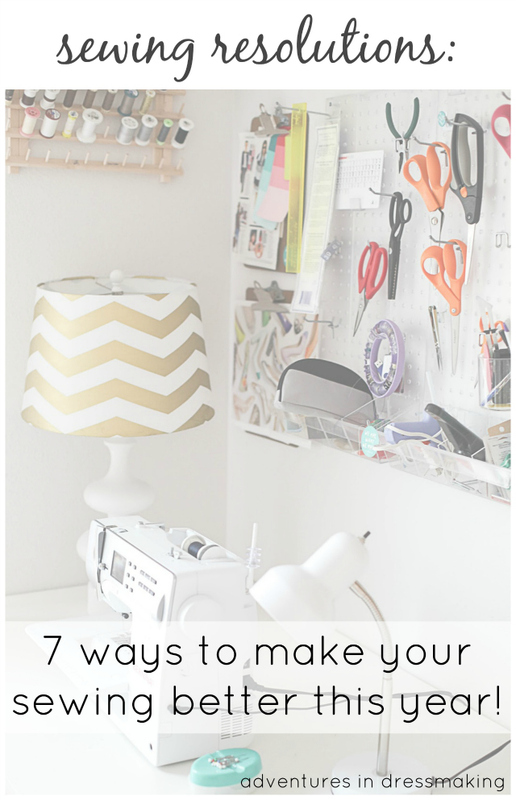 Start using these 7 simple tips to be more inspired and do more quality sewing in 2014 and years to come. And check out my top Sewing Circle posts for more sewing help! And readers, I'd love to hear your tips as well! What simple changes have you made to improve your sewing?! In progress shots! Something I never do but really should. Thank you for the reminder and Happy New Year! I can't say I'm a big resolution maker either but I like to set tasks and etc to keep improving on things! I liked your list of things regarding better sewing, I was going through my stash the other week for some lining and was shocked to see that I need lining bad and only just had enough for what I was doing so now I'm on a lining mission. Great Post Suzannah! I definitely agree with no.4 I am so bad at making time for sewing for myself, I always enjoy it so much when I do. And no.7 If I make something with a fabric that I don't love it never turns out as well as if I use a fabric I adore! I agree, improving is always a goal! Lining is such a pain, but so important! Totally! A picture = 1,000 words! Happy New Year! Definitely!! Best wishes for photo-taking in the new year! Gilmore girls is a must for anything be it sewing,cooking or cleaning, no questions asked!